A small town in Minnesota just gave an extended middle finger to one of the state’s most impotent bureaucracies. What is setting up is a school yard brawl between two underweight, skinny greasers with switchblades. Could be a lot of slapping and name calling, but if things go horribly wrong there is the potential that someone gets their throat slit. Detroit Lakes is a town very similar to my hometown of Brainerd, with the primary distinction being that their auto-based, Ponzi-scheme development blowout happened within the city limits where here in Brainerd that mess was absorbed in the neighboring (competing) city of Baxter. In a grass is greener kind of way, I’ve always perceived them to be doing a little better than we are here. I’m probably wrong. Charles Marohn is right to be infuriated with Minnesota's shoreland density requirements for cities -- all Minnesota citizens should be disappointed. The State's shoreland development standards are old. These standards are outdated with regard to lake protection, and they're inconsistent with good land use development principles and practices. When the Minnesota DNR attempted to revise the 1970-80s era standards several years ago, Governor Pawlenty dismissed them because, perhaps rightly, the public and local governments might not have accepted the shoreline buffer provisions that were proposed to protect water quality. Those proposed standards would have also allowed cities to use their own density standards provided that the area was served by sewer and proper stormwater controls. In Lakeshore Living, we speak to the changes that are necessary and how we could use sound place-making principles and good bottom-up community design. 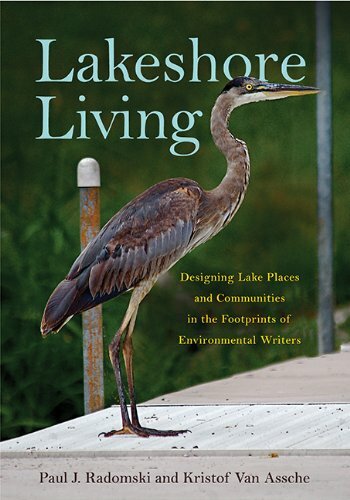 Charles Marohn helped me, a lake ecologist, better understand Strong Town principles. Thanks Charles!